Our readings this Sunday tell us that with the Kingdom of God, up is down and down is up. The poor are rich and the rich are poor. Put your trust in man and you will like a "barren bush in the desert." Put your trust in God and you are like a "tree planted beside the waters." In our first reading (Jeremiah 17:5-8), the prophet Jeremiah was preaching against the king and his leadership who were seeking the protection of other nations rather than the protection of God. "Blessed is the one who trusts in the Lord.". Thus says the LORD: Cursed is the one who trusts in human beings, who seeks his strength in flesh, whose heart turns away from the LORD. He is like a barren bush in the desert that enjoys no change of season, but stands in a lava waste, a salt and empty earth. Blessed is the one who trusts in the LORD, whose hope is the LORD. He is like a tree planted beside the waters that stretches out its roots to the stream: it fears not the heat when it comes; its leaves stay green; in the year of drought it shows no distress, but still bears fruit. In our Gospel reading (Luke 6:17, 20-26), we hear a similar dichotomy presented by Jesus. It is an excerpt from Jesus' Sermon on the Plain known as the four blessings and the four woes. It is a message completely counter-cultural to the thinking of the day. Blessed are the poor and woe to the rich. Jesus makes clear that the Kingdom of God will be found with the poor, the hungry, the weeping and the outcast. 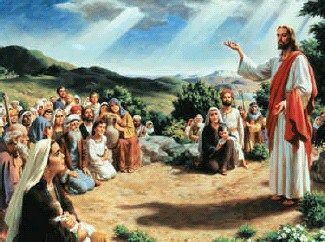 Jesus came down with the twelve and stood on a stretch of level ground with a great crowd of his disciples and a large number of the people from all Judea and Jerusalem and the coastal region of Tyre and Sidon. And raising his eyes toward his disciples he said: “Blessed are you who are poor, for the kingdom of God is yours. Blessed are you who are now hungry, for you will be satisfied. Blessed are you who are now weeping, for you will laugh. Blessed are you when people hate you, and when they exclude and insult you, and denounce your name as evil on account of the Son of Man. Rejoice and leap for joy on that day! Behold, your reward will be great in heaven. For their ancestors treated the prophets in the same way. In our Epistle reading (1 Corinthians 12, 16-20), St. Paul resents us with another clear choice - Do we believe that Christ rose from the dead, or don't we. If we don't, we are "the most pitiable people of all." Brothers and sisters: If Christ is preached as raised from the dead, how can some among you say there is no resurrection of the dead? If the dead are not raised, neither has Christ been raised, and if Christ has not been raised, your faith is vain; you are still in your sins. Then those who have fallen asleep in Christ have perished. If for this life only we have hoped in Christ, we are the most pitiable people of all. But now Christ has been raised from the dead, the firstfruits of those who have fallen asleep. Often in life, we are presented with binary choices -- Do you put your trust in God or do you trust in men; Are you detached from the things of this world or do you cling to your wealth and possessions; Do you believe Christ rose from the dead or don't you; Do you believe in the real presence of Christ in the Eucharist or don't you. We who are Catholic Christians are defined by our choices. And our choices define our actions; and our actions define our destiny. Straddling the fence is not a luxury we have.